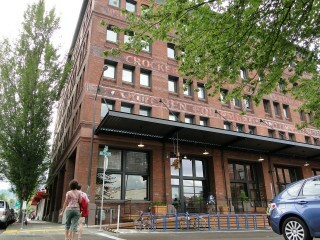 One of dozens of buildings put to new use in the Pearl District. All photos in this post by Wayne Senville unless otherwise noted. Then it became home to light industrial uses and warehouses. 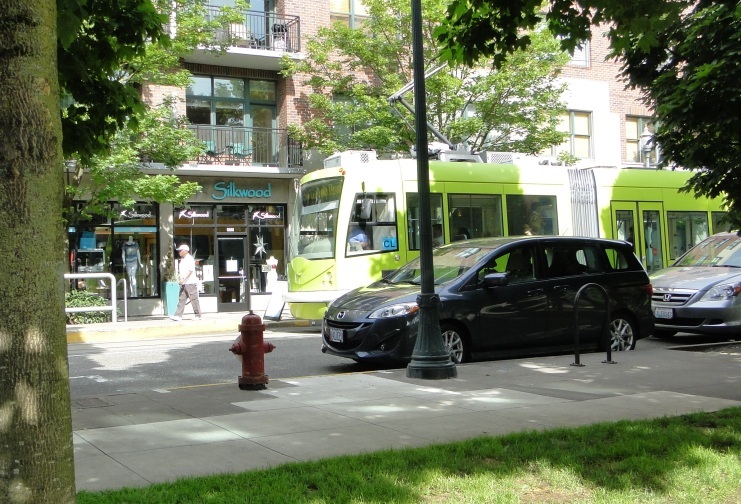 Its most recent incarnation has been as a urban, mixed-use area, stuffed with bars, restaurants, and new housing (sometimes located in renovated older buildings). That's what city planners and elected officials had in mind for this part of the city, just north of downtown some thirty years ago -- and it's a vision that's come to pass. One of the keys to the area's growth was the construction in 2001 of a streetcar line linking the Pearl to downtown. Aerial map and conceptual plan map from the Urban Design Framework study for the three parks (in green in the aerial map). 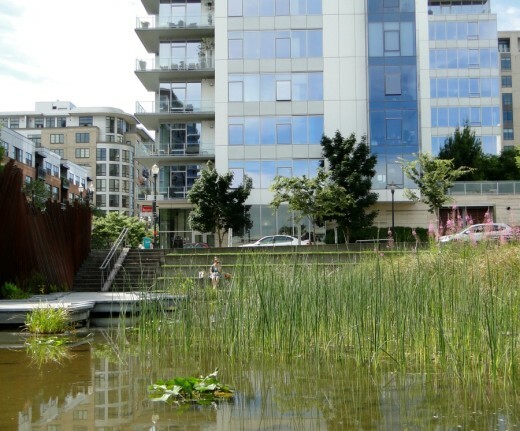 From south (bottom) to north: Jamison Square; Tanner Springs Park; and The Fields. 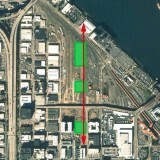 The 34-acre railyard is clearly visible in the old aerial photo. 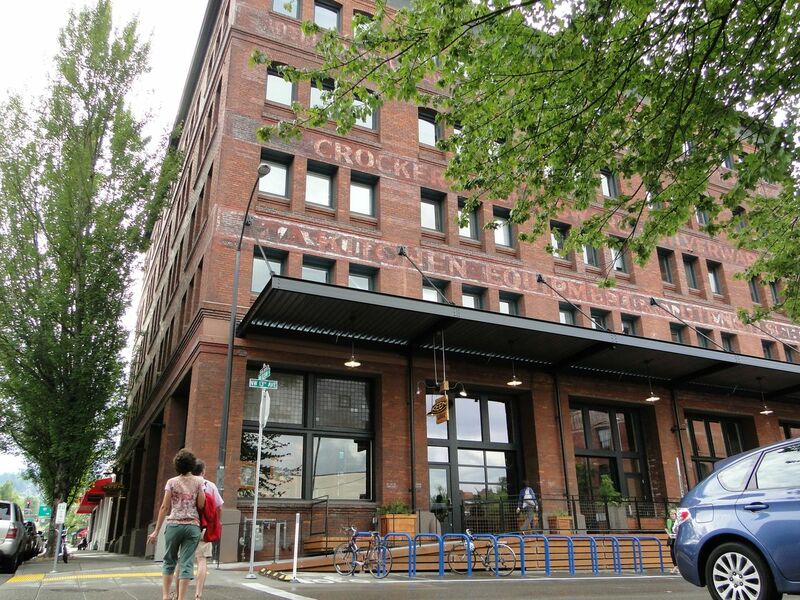 The Pearl District spreads to the west, up to where Interstate 405 bisects Portland. In the conceptual plan map, Jamison Square is the block highlighted in blue; three blocks north is Tanner Springs Park (originally designated as North Park); then the Fields is two blocks further north, close to the river. But another important element of the plan called for the creation of a set of three new urban parks. Noted landscape architect Peter Walker, 3 was retained by the City in 1999 to develop a "framework plan" for the three new parks. Tanner is more tranquil and contemplative. Jamison is more of an active, urban park. The Fields -- the largest of the three and the closest to the Willamette River (not yet opened during my visit) will have recreational areas and also serve as a dog park. A 20 to 28 foot wide pedestrian boardwalk runs along the east side of the parks (and along the non-park blocks in between), replacing the sidewalk and parking lane on the west side of NW 10th Avenue. It provides both a physical and visual connection between the three parks, and then to the river. When I first passed Tanner Springs Park, I did a double-take. There in front of me was what looked like a combination of the kind of natural area you'd find far outside the city, melded with distinctive, man-made design features -- some referencing the history of the site. It was -- to me -- a combination that worked well together. 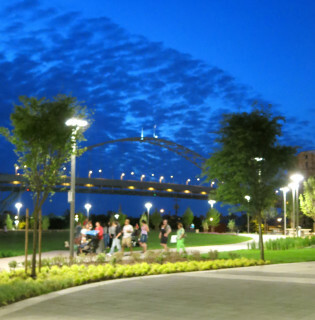 The wonderful design and features of the park, which opened in 2005, were the result of talented landscape architects at Atelier Dreiseitl, a renowned German design firm, who worked with local landscape architects from GreenWorks, P.C. "The park is unlike any other in Portland. Sloping down from its western edge, it transitions from a 'relaxation meadow' with stone walkways, through a 'cleansing biotope' with wetland plantings, to a 5,300-square-foot pond at its lower eastern side. The slope’s grade change is just under six feet, accomplished by lifting the park’s western edge some 20 to 24 inches above street grade. 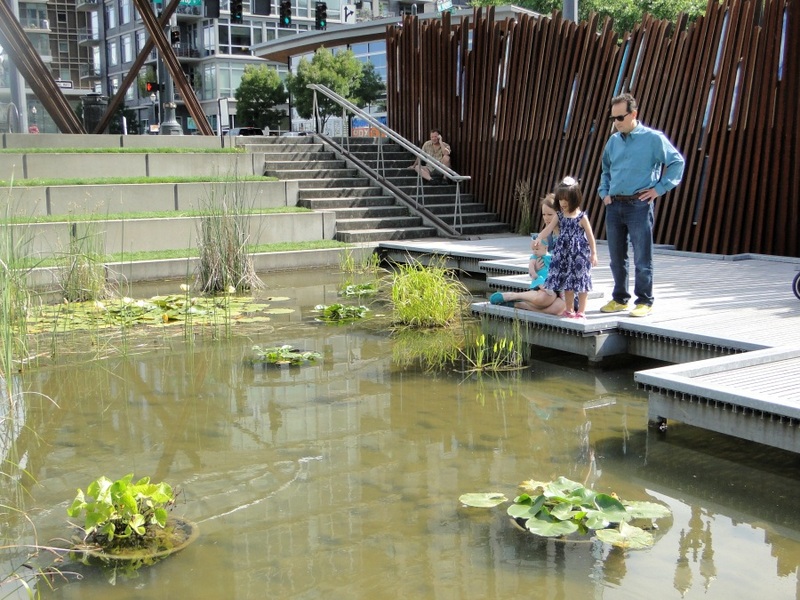 This provides a feeling of detachment from the urban surroundings for visitors at pond level." As Hazelrigg also notes, "Stormwater management is a central feature. All rainwater that falls on the park, which encompasses 1.2 acres curb to curb, drains to a cleansing biotope and lower pond. … This is the first city block in Portland that is designed so that surrounding sidewalks drain into the site rather than into the streets and their storm drains." Here's a short video I took walking through the park (my apologies, in advance, for the poor quality of my video "techniques" -- but I think the short clip will still give you at least some feel for the park). You'll note the railroad tracks set on end. They are part of an "art wall" that runs along the park's eastern edge. A nice acknowledgement of the area's prior life as a railyard, and also a visually pleasing border to the park. For a good short overview of the Park, see "Tanner Springs Park -- A Lesson in History and Sustainability." 8 You'll find more technical detail about the park in the Hazelrigg article cited above. Jamison Square, which opened in 2002, has a completely different feel than Tanner Springs Park. While it's also an oasis from the surrounding dense urban environment, it's a more active, lively area, where I found people sitting down for picnic lunches, and kids romping through the park's very special fountain. 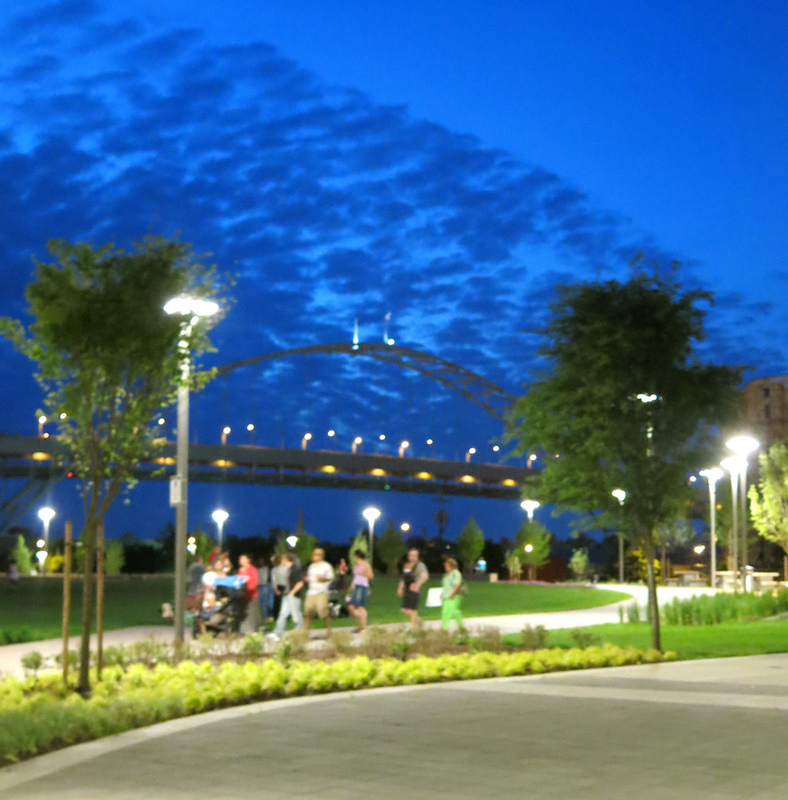 "The park design includes three main elements: a fountain, a boardwalk, and an outdoor gallery. The stone fountain metaphorically expresses the idea of an 'aquifer,' as water pours out of the stone steps, filling up the gently sloping ground until the water is about 12 inches deep, at which point the water drains back out and the ground is dry. 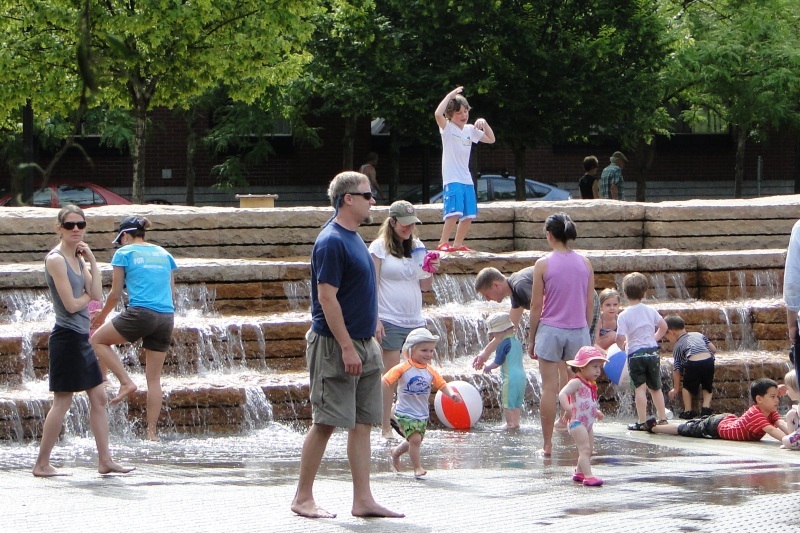 When the fountain is on, it is an object of play and delight for people of all ages. Alternatively when the fountain is turned off, the space functions as a shady plaza for special events." Take a look also at the dozen photos of the park on the PWP web site. Having stopped by Jamison Square on two sunny days (and one rainy one) I can attest to the popularity of the park and its water features. 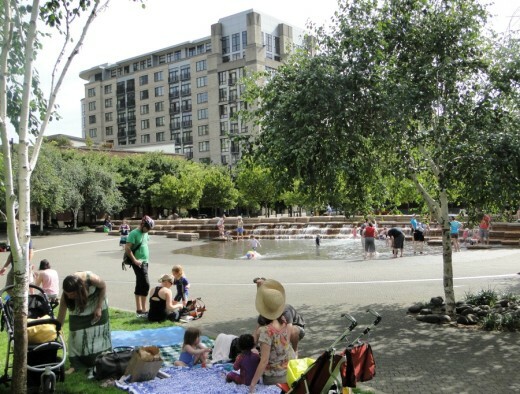 In fact, as Portland planner Troy Doss acknowledged, Jamison Square has become much more than a neighborhood park, attracting people from across the region on warm summer days. The Fields park. photo by tobakhopper, Flickr creative commons. 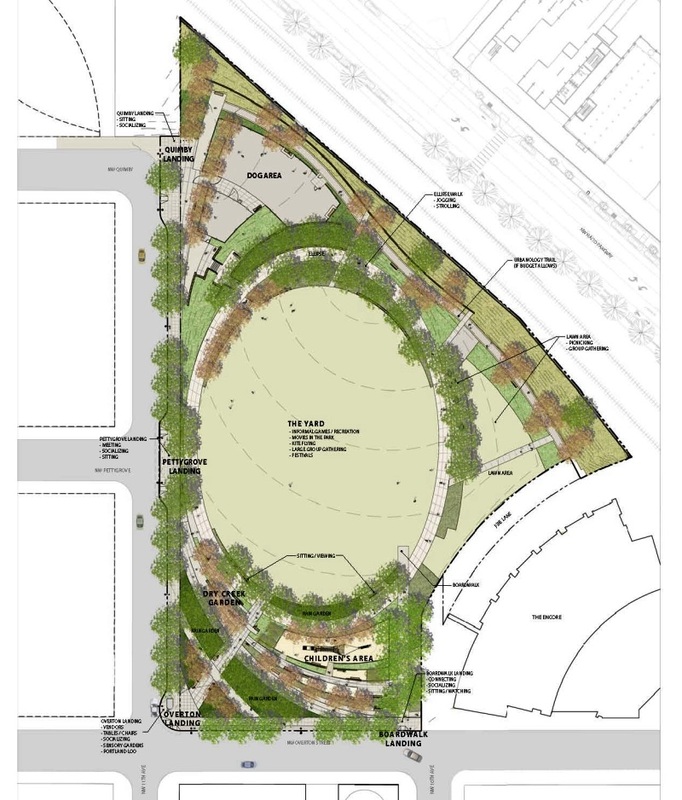 While I didn't have the chance to see the last in trio of parks, the aim of The Fields is to provide an open, recreational area serving the neighborhood. A portion of it will also be a dog park. "[The Fields is] the largest of the three River District parks, the majority of the site is devoted to a relatively flat, irregularly shaped grass meadow maintained for passive and informal recreation." Set out below is the final plan drawing for the park. The photo above highlights the proximity of the park to the Willamette River, with the Fremont bridge (I-405) in the background. Note: We're taking next week off -- our remaining posts about Portland and about the International Making Cities Livable Conference will resume on Monday, August 26th.